02-Sep-2006 -- This confluence lies in the fertile Uzbek Fergana valley, in the middle of the triangle spanned by Namangan, Haqqulabad and Uchqorgan. I started out in Farghona and took a shared taxi to Namangan. That day was the first day of school after the summer holidays and the streets were flooded with flocks of children in their best clothes. In the central Bobur madaniyat they gathered in thousands to wolfe down fatty street food, loosing it afterwards on dangerous looking soviet rides, and having their picture taken on one of the many stands. I asked around if anyone would be kind enough to drive me to the spot and back again. I soon someone agreed to do it for a small fee, and of we went. But first he invited me to dinner, then we drove to his home village at the outskirts of Namangen to the local district school where we picked up the local french teacher who volunteered as interpreter. He was a nice and very clever man who was instantly interested in the concept of confluence hunting and agreed to come with us, after he had attended to his duty's. We spend the meantime at my new friends house drank tea and ate a little (again). Before we took of in the early afternoon we discussed the legality of our little venture. I admitted that I had no explicit written permission to operate a gps device and visiting a confluence. But I pointed out that there can be no harm in driving to a random spot and taking pictures of what most likely will be a just another cotton field in a vast cotton monoculture. Besides that a foreigner has successfully visited at least one confluence in the valley after the crackdowns following last years uprising. The caution was well advised, because at the time of writing the valley is literally crawling with police, militia secret police and military forces. There are checkpoints at almost every crossroad. Only every tenth vehicle or so is pulled, usually to extort a small amount of money from the drivers, but there was a certain risk that being stopped by the security forces would cause us major headaches (especially because our driver had lost his driving licence some time ago). We decided to avoid checkpoints, and that I would keep my mouth shut if we were flagged down. The distance to the confluence was about 34km. The comparatively dense road network in the valley allowed us to drive within 800m distance of the confluence. 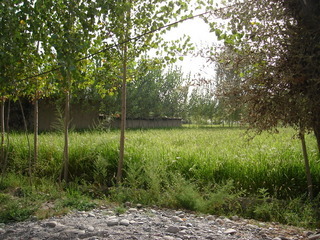 The confluence lies in a backyard in a village called Kugai, named after a some kind of reed with which the villagers used to cover their roofs. As expected all around the village vast cotton fields stretched in all directions. We quickly took the pictures and went back. Of course the car we used (an ancient moskvitch) broke down, because we had operated it with benzine instead of methane for a too long. After getting back we enjoyed an excellent dinner and talked endlessly.